The breeding scene in the north of England is to receive a notable shot in the arm with Mondialiste, the dual Grade 1-winning son of Galileo, to take up stallion duties at Geoff Turnbull's Elwick Stud in County Durham. The seven-year-old, who was bred by the Wertheimer brothers, showed smart form at three, most notably when belying big odds to finish a close third to Havana Gold in the 2013 Prix Jean Prat. Before his five-year-old campaign got under way he was bought by Turnbull and switched from Freddy Head's yard to the Yorkshire stable of David O'Meara, for whom he immediately began what proved to be a steep upward trajectory when running a close second in the 2015 Lincoln handicap. By the conclusion of his first season with O'Meara, Mondialiste had added three victories to his CV, namely a ten-length demolition of the Listed Pomfret Stakes, a neck defeat of Mutakayyef in a high-class renewal of the Strensall Stakes, and his first Grade 1 when coming with a thundering late run to claim the Woodbine Mile. On his penultimate start at five he ran a highly creditable second to Tepin in the Breeders' Cup Mile, a performance for which he first achieved his peak Racing Post Rating of 118. 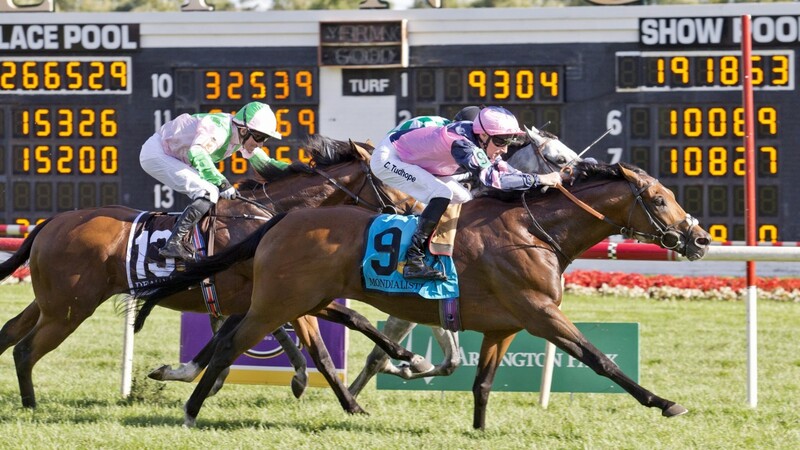 Mondialiste highlighted his soundness and enthusiasm for racing when again running to an RPR of 118 with a close second to Time Test in the following year's York Stakes, before once more crossing the Atlantic to claim his second Grade 1 in the Arlington Million. He has been unable to add to his five career victories during the latest campaign, but has run with great credit in this year's York Stakes, Woodbine Mile and Shadwell Turf Mile at Keeneland on what proved his final start. "Mondialiste is without doubt one of the bravest horses I’ve trained," said O'Meara. "He has a big heart and he always really sticks his neck out. He's been a pleasure to train, with a great temperament and a fantastic turn of foot. I'm excited at the prospect of training his progeny." Mondialiste's innate talent on the racecourse is underpinned by a deep Wertheimer pedigree. Not only is he by the all-conquering Galileo, but he is out of the 1997 Prix Maurice de Gheest and Prix de la Foret winner Occupandiste, the highest rated progeny of Kaldoun by RPRs. He is a sibling to seven winners, including his brother, the Listed-winning Planetaire, and his half-sisters Impressionnante, a Group 2-placed daughter of Danehill who is better known as the dam of Prix du Jockey Club hero Intello, and Prix du Petit Couvert winner Only Answer. The pedigree remains very much active, with the likes of Ribchester appearing further back in the family. "Since opening the stud three years ago we now find ourselves in year six of our business plan," said Turnbull. "The stud continues to develop at a rapid pace and now has stabling capacity for over 100 horses. We're very excited at the prospect of standing Mondialiste, our dual Grade 1-winning son of Galileo, at a brand new, purpose-built stallion facility in the north of England. "We look forward with great anticipation to Mondialiste's first foals and have 25 mares at Elwick that will all be covered by him to give him the best possible start to his stallion career. We've already received a huge amount of interest from across Britain and Ireland." Mondaliste is to stand at a fee of £6,000.